Full disclosure: I am a fan of the 1984 “Supergirl” film starring Helen Slater. “Oh, a guilty pleasure?” you might ask. Well, yes, but it is much more than that. When viewed in its intended 124 minute European edition or 138 minute Director’s Cut (as opposed to the incoherent, butchered 105 minute American version), ‘Supergirl’ is a well-crafted, entertaining movie with a lot to offer. Yeah, you heard me. Comic book movie adaptions are now standard blockbuster fare often accompanied by critical praise, prestige, and respect. This was not always the case, especially back in 1984 when “Supergirl” hit theaters after a long and troubled post production. 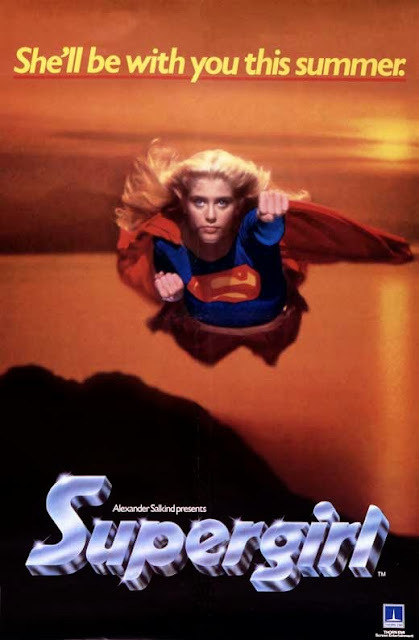 “Supergirl” was self-financed by “Superman" (1978) producers Alexander and Ilya Salkynd. D.C. Comic’s parent company Warner Bros. held the distribution rights. After releasing the movie in Europe, they decided to drop the film just before the targeted North American release date in the summer of 1984, citing the disappointing returns of the dreadful “Superman III” (1983) as the reason. The rights were eventually purchased by TriStar who cut the film’s 124 minute running time down to an incoherent 105 minutes and dumped the movie into U.S. theaters in November of 1984 with little fanfare. The result was a choppy, disjointed origin story and a sloppy film that was savaged by critics and ignored by movie patrons. Actually the film is not without merit. It plays beautifully as a guilty pleasure and works very well as a children’s film. The colorful movie has slowly attracted a loyal cult following since the release of Anchor Bay’s two disc limited edition DVD release in 2000, a fully loaded package that includes the 124 minute international version, a 138 minute director’s cut, and a boatload of enticing extras. “Supergirl” has an enduring popularity for several reasons; the art direction, Faye Dunaway’s delightfully over-the-top campy and yet menacing portrayal as the film’s villain Selena the Sorceress, and the sensational musical score by Jerry Goldsmith. 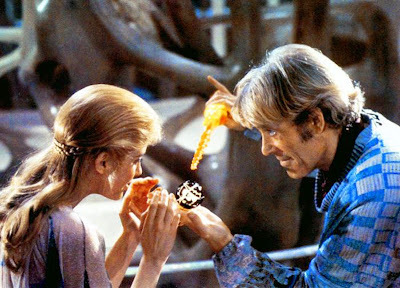 But it all starts with the presence of the luminous, fresh-faced Helen Slater who exudes an ethereal charm in the flying sequences. The captivating actress is wonderful in this role and perfectly cast as Kara Zor-El/Supergirl. 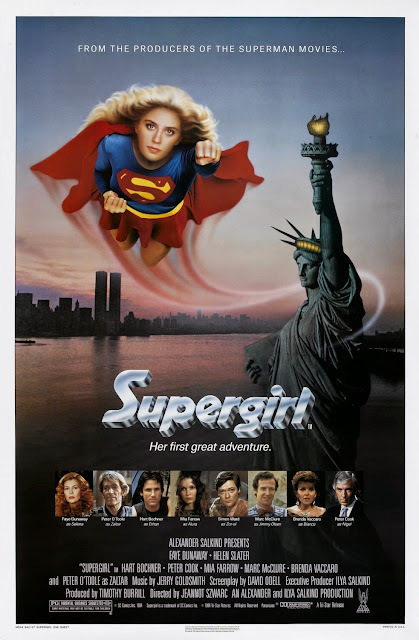 Working from a screenplay by David Odell, novelist Norma Fox Mazer does an effective job of capturing the essence of Helen Slater’s Supergirl and her alter ego Linda Lee. She manages to capture the wide-eyed innocence of the character and has fun with it. And yet, there are more serious passages where she makes us feel the character’s sense of loneliness. The author also does a bang up job of nailing all of the supporting characters, with spot-on, creative phrases. Norma Fox Odell never forgets this is above all, a fun movie and she does a good job of creating natural character driven humor. I actually laughed out loud several times while reading this book, especially when it came to the scenes involving Lucy Lane. But where this book really takes off is in the characterization of Selena. Every scene written from her point of view is an absolute blast. Bottom line: This is a skillfully written novelization and like the 1984 film itself, is an entertaining, colorful, comic book adventure with great humor and a sense of wonder.